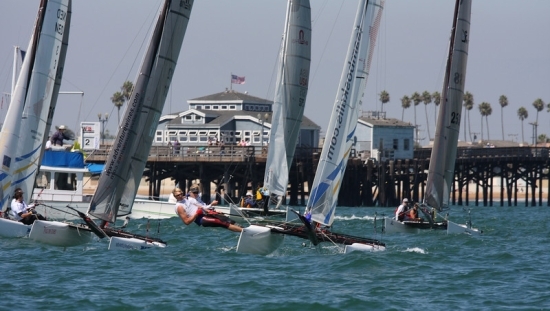 All Photos: Jeremy Leonard/SurfCityRacing - F18 North Americans 2009 @ABYC. The F18 Worlds goes to USA for the first time, and the US F18 fleet and the Alamitos Bay Yacht Club is working hard to provide a truly International event. We have already 15-20 crews only from South America (Arg, Chile and Uruguay) and lots of interest in Central and Caribbean that will join the US and CAN sailors, also some Europeans and of course the Aussie Container Task Force. Yesterday the local fleet had a meeting here to organize our own container/charters and where to stay. Almost 10 boats interested, so we'll expect the biggest Argie representation to date, at Erquy we sent 5 boats.The guys here are training quite hard, and the formal qualification races are providing us a good training ground. Vittorio Bissaro and Lamberto Cesari face new challenges for 2012, sadly they part ways on the F18 but they still will be racing together on the Italian LAC C-Class Challenge. I named them the 2011 F18 Worlds Dark Horses, and they delivered ending 3rd at Balaton F18 Worlds, podium and excellent result for being Youth World F18 Champs. 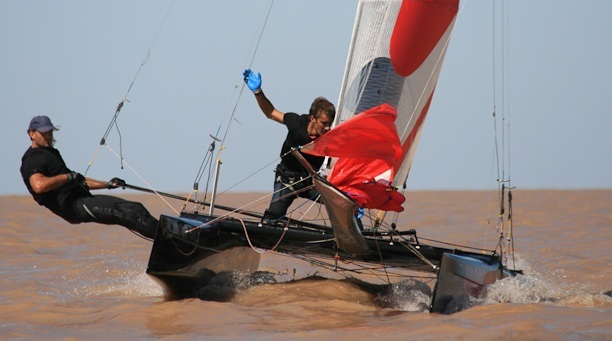 But I think Vittorio joining a Laser sailor is a good move, as here in Arg some of the best F18 sailors come from the Laser fleet too, of course they have all sold those logs by now. So Carlo: Non c'è più tornare indietro. By Lamberto Cesari - "The season is going to start with a little revolution in the Bissaro-Cesari team, currently holding the bronze medal at the 2011 Formula 18 World Championships, and former Youth World Champs. Lamberto will not be sailing Formula 18 anymore due to his personal business and he has been replaced by Carlo de Paoli, a young talented Laser sailor, which holds some Italian championships in Optimist and Laser. 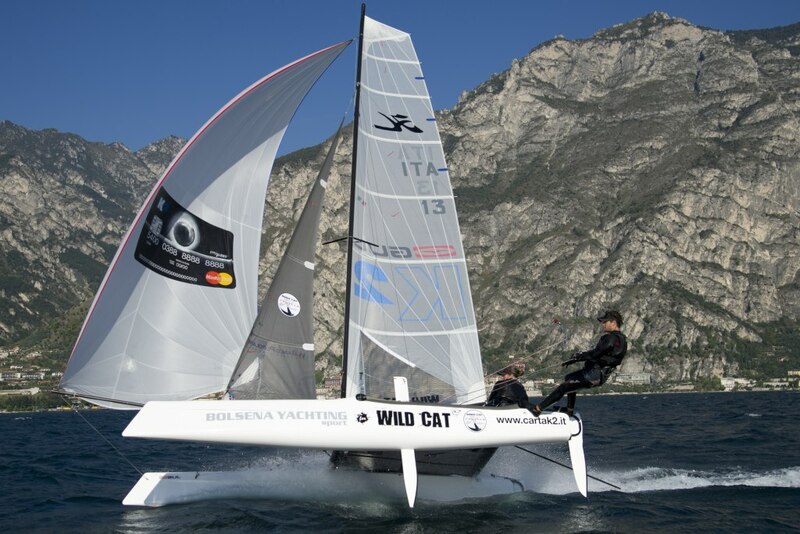 Vittorio and Carlo will be sailing the Hobie Wildcat as usual, participating in the Napoli Regatta on 31 March-1 April, a preliminary event for the AC45 Series, then Eurocat in Carnac and the European Tour over the season, concluding with the World Championships in the USA. Moreover, Vittorio and Lamberto will still sail together on the C-Class of Challenge Italia competing for the 2013 Little America´s Cup. 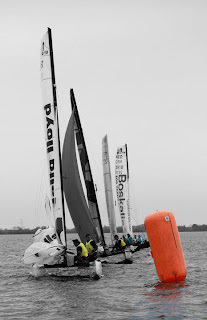 Under the name of Challenge Italia they will also sail the Bolster Teamrace Knockout in Amsterdam on the 14 of April which is expected to be a great show!" 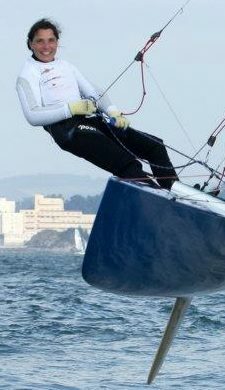 Thijs Visser , F18 World Champ with Coen de Koning in 2009 and together top current F18 crew, also participated as helm at last F16 Worlds. 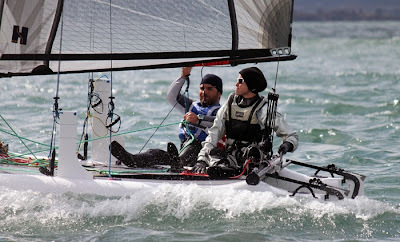 He will be campaigning for Rio 2016 and was present at Santander trying all boats. Below his personal view on the trials. Left: Thijs and Celine Van Dooren, also on previous post on the Blue Marstrom Tornado. A new experience for some racing mixed....he .I will get Celine's view later! - CSN:First, did you recover your stuff?? how was that? Thijs Visser: No, I didn't recover my phone, wallet or sailing watch. Too bad, it never happened to me before! Luckily there are always other sailors to help you out! Thanks guys! - With whom did you sail? Sailed together before? Sailed with Celine van Dooren. 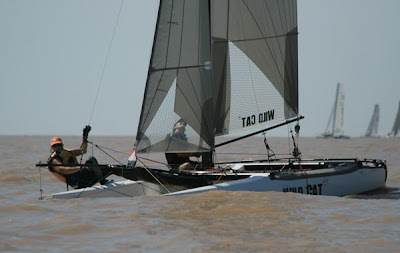 She won the F16 Worlds with Bundy last year and she is a though crew. I was happy to let her do the hard work, so could sit at the back holding the tiller for a while… No! I think we made a good team! We never sailed together before, but we know each other quite well. ISAF selected two dutch sailors for the mixed multihull trails: one man and one woman, that's how we end up sailing together last week. I was part of the group of test sailors, not one of the manufactures teams. 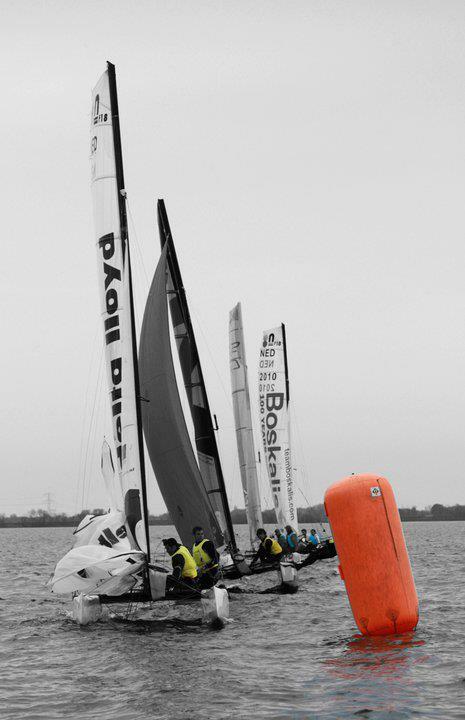 Our subscription went true the Dutch Sailing Association and we were testing the boats for the ISAF equipment committee. - A report was due after each sail? After each session on the water we had to fill in a evaluation form on each boat you sailed with. They asked us mostly about the performance of the boat in different conditions while racing, but also about sheet loads, ideal crew weight, safety, boat layout and our excitement for the boat. - Did you sailed all boats? Yes everybody did. They tried to have each team on each boat for 3 times. First session to get used to the boat, second one to race it in flat water and the third session to race it in the waves. The plan was to test 4 boats boats a day, but because of the wind conditions that wasn't the case, so not everyone was able to get all three sessions on all boats. - Which boat in your opinion was the best suited for Mixed ? I think the Nacra 17 is the best suited for mixed sailing. It is the right size and I really like the technology behind it! It is challenging to sail, but not to much in a physical demanding way, which is good for mixed teams I think. If you sail it well it pays a lot. It might not had the time to be as fine-tuned like the Tornado or Viper, but it is already is a joy to sail. The curved boards work really well and it gives more options and tacking and gybing goes really fast. - Which was the overall best beyond mixed, like as a personal feel at helm for ie. It's difficult! I really liked the Tornado for example. Everything just works on that boat. It is steering very nice and it's fast, but you really don't want to underlay with that boat. 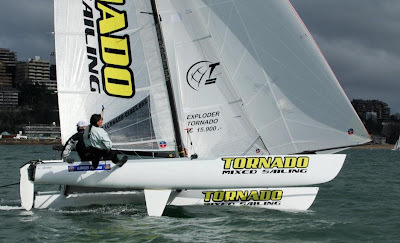 The T is horrible to tack compare to the newer, smaller and lighter designs and I like a boat that tacks and gybes easy because of the more strategical and tactical options you will get during racing. 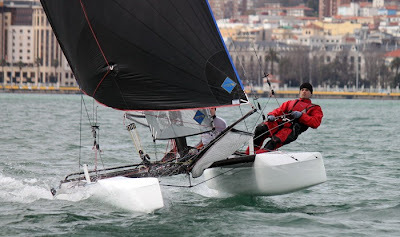 The Viper and the Nacra F16 are a joy to play with, there are very easy to sail and nice to race. But for me the feel a bit small and more like a step back coming from F18's. 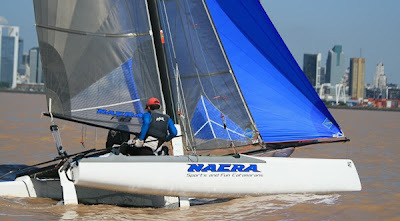 At the end the boat I am the most excited about is still the nacra 17. - Which should be finally selected and why? I've been thinking a lot about this these last couple months and I think the selected boat should be exciting to sail and watch. Like the sailing on the AC45's and 49ers the people watching the racing should immediately see that these boats are hard to sail and that the people sailing them are professionals. If I am going to do a Olympic Campaign I like it to be a boat which will be a step into the future, so it's design can last for decades. (Although I hope we will have 2 cat classes in 2020!) 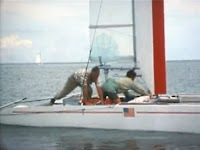 The boat should also have a high quality so it would be able to sail competitively for two seasons or more. 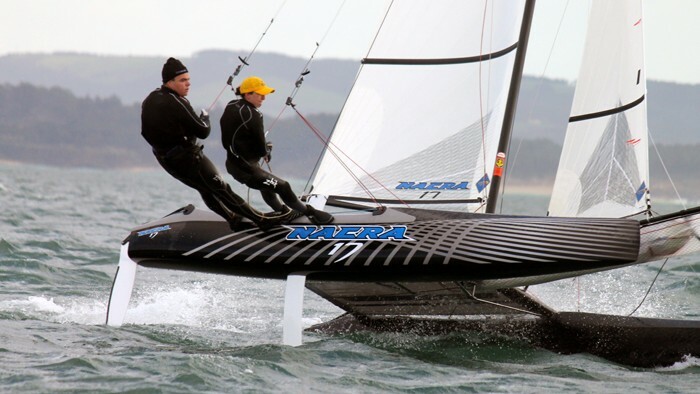 I think the boat that suites those criteria best will be the Nacra 17. - Any other consideration you want to inform? The upside is that there is always someone with a hairdryer to make you do a quicker polyester repair during night! And it was a lot more social after sailing, I hope it will stay like that! - How did you went on the races with diff boats sailed? It really depended on the boats you sail with. Luckily I did not had to race the HC16, because mostly they were finishing after the start of the next race. Olympic Trials at Santander: Gaebler's Report. 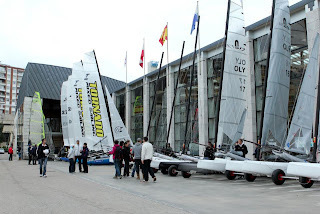 "Super Sailing in Santander – ISAF Multihull Evaluation in northern Spain was a fantastic event. The Good and Bad moments of the Trials. A report from Roland Gaebler." What a great place to sail! Inshore with flat water and tactical challenges. Offshore with real waves and nice surf. The Club made an amazing job. Its one of the best places for sailing we ever saw. Nice facilities, brilliant beaches and snow on the mountains. Purely one of the nicest sailing scenery. Fantastico! We missed a bit the strong winds and the big waves to test the material at the limit. But it was good to have all the sailors their feedback about the Tornado. They gave us nice comments what they like or not. Especially we were interested in the comments from the women, how they like the sportive challenge of the boat. At the helm no one has any problems to hold the carbon tiller and some of the Ladies won the practice races in front of our self. In minutes they got familiar with the boat and brought it to max speed in a very short time. They feel the difference and the high quality of the Tornado. The stiffness of the platform which was 11 years old! As crew some said it was easy with the kite and mainsheet, some others said it was too hard to handle the sheet loads. It was great to get this feedback and comments from the sailors. Because for us it’s normal and we have the muscles to handle the loads. But we think this is exactly the point. If a boat is too easy to handle, it’s not deserves to be at the top sport event of the World. The Olympics are for the very best Athletes and it should be sportive challenges were you should train for. Nahid Gaebler (Tornado crew, 44 years old) is a normal woman with no special fitness training, and she easily handles the sheet loads of the Tornado up to 30knots of wind (check final day Worldchampionship 2011). We may change the sheet system from the gennaker (which is actually direct 1:1 with two automatic ratches) with an extra block and make it 1:2. Also the mainsheet (which is actually 1:8) we can change with only one extra block to 1:12. This way we make it 50% easier on the gennaker sheet and 33% more easy on the mainsheet without having too much extra sheet length. Wait and see our solutions! Sometime it needs such a test event to come to new innovations. The comments from sailors who not sail Multihull are also very helpful. Also the questions from the ISAF evaluation panel makes us thinking again what the point is and we looking for the best solutions to fulfill all the criteria ISAF wants. Sometimes we are too much in our own box. So the evaluation event brought us new friends but also creates innovations. Only as a team with the sailors and ISAF we can bring our sport into a new era. 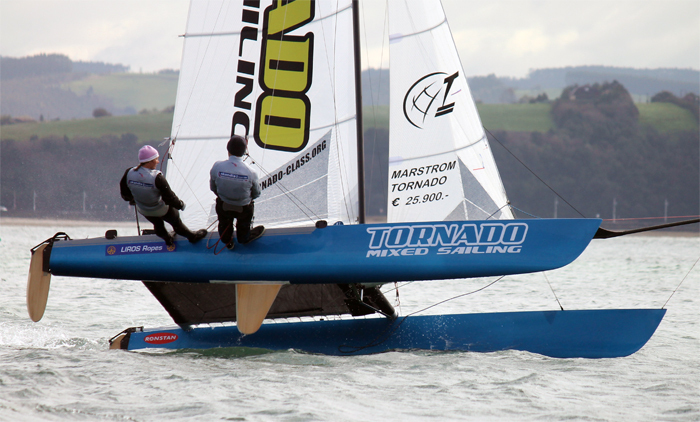 The Tornado was the fastest boat in all winds on all courses. Same way we came up with one of the lowest prices for the boats. So why pay more to sail slower? We present purely the best price-performance for an Olympic boat. 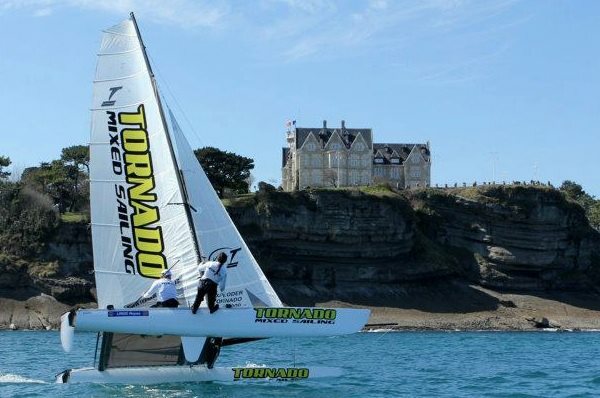 The Tornado is a proven formula for the Olympic Games in all wind and wave conditions and has a top image, the media/spectators and the next generation on his side. On top of it we are the only class who made the offer for supplied boats for the complete Olympic Circuit (World Cup Series, Worlds- and Continentals, Olympics). With our Olympic background, we know what we need to do to bring Olympic Sailing to the next level in such hard economic times. But we experienced also some things, we not like so much. 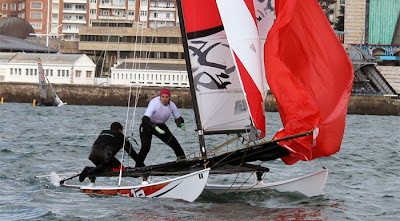 Fernando Leon (Gold Medal 1996) and a Hobie Cat women (F18 Crew) from Santander and me were not allowed to sail the day with the best wind conditions, because we were too heavy. The crew weight limit was 140kg. Me and Nahid are far away from it. Also the Spanish legend Fernando Leon and the Girl who weight 73kg we not allowed competing at the best day of the week against the others in a real manufacturer race. Imagine, a girl was stopped to sail because she is too heavy. No wonder the Spanish were on fire after this happen. But exactly this showed the point where we are now. Some weeks before ISAF makes final decision. Nahid made an analytics and try to find every mixed team we can get in F18 and Tornado. The Facts are: 83% of the Mixed Teams in the F18 are above 140kg (average is 150.3kg). In Tornado 87% of the Mixed Teams are over 140kg (average 148.3kg). 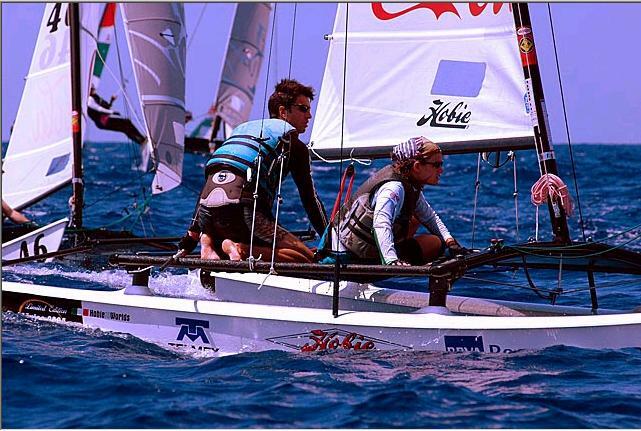 For sure it looks different in the Hobie 16 and F16…… but if we count all Multihull Mixed Teams together still more than 50% are over 140kg. 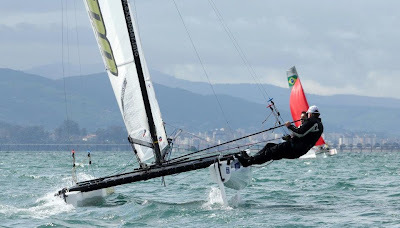 We have many Women and Men from Laser Class who really like to sail mixed multihull for Rio 2016. If ISAF continue the way with the 130kg average target (middle between 120-140kg), they all can give up their Olympic Dreams. Also the Matchrace Women and Starclass Sailors have great interest in Mixed Sailing after they lost their boat. They can bury their Olympic Campaigns. A man above 80kg can only sail Finn-Dinghy and a Women above 65kg has big problems to find a crew with the actual target from the ISAF which is based on an Asian Submission. 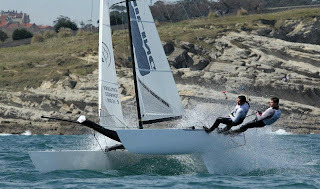 But the Asians never turned up in Santander for testing the multihull. So ISAF following a wish from Asia and the Asians were not here to test the boats. Sorry, this is a complete wrong move and need urgent correction before ISAF conference in May. I want to say it in very clear words: If we end up in an F16, we will have ultra lightweight teams (around 120kg) in Rio de Janeiro, where we have light wind forecast. This means most of the actual mixed teams can forget the Olympics. This way Mixed Sailing may end in a disaster for our Sport in the Olympics. Also this I like to point out: I am not want bring the Tornado always forward. Take a light F18 (like the Phantom Project or a carbon Wild Cat or any other hitec F18) or the new Nacra 17 (which is not far away from an F18). But please not an F16. 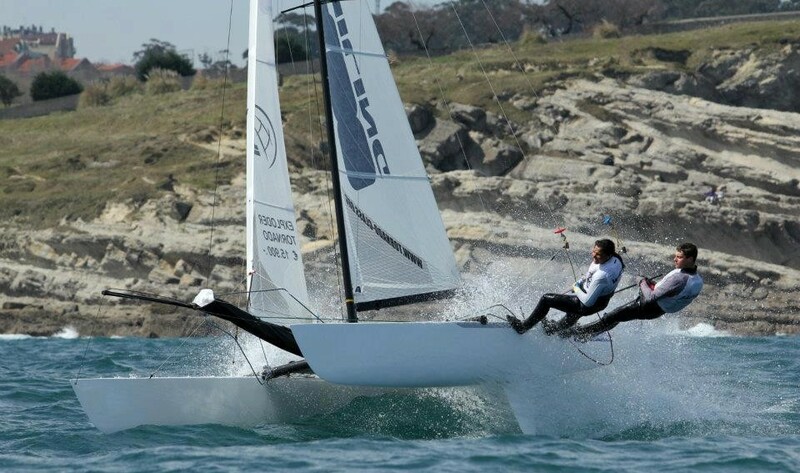 This boats are perfect for the Youth Olympics, ISAF Youth Worlds and National Youth programs. This I said to Carolijn + Darren one year ago. I said to them we should work together. F16 for the youth. F18 for the big fleets. 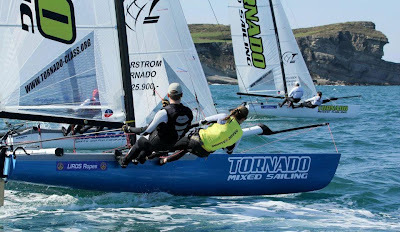 F20 (Tornado) for the Olympics. But they are on their own mission. The Olympic Games are the top of Sports. It is the peak for Athletes. 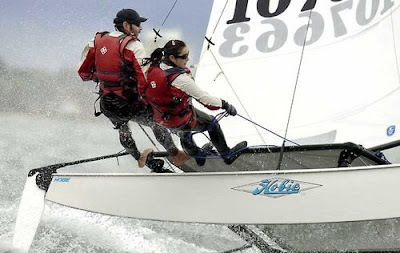 It should be a sportive Challenge for every size of women and men and deserves a boat which fits to the Olympic Spirit. Our sport not just need a boat. We need a new race format which fits perfect for the media, spectators and sponsors. Thank you all for the interest and support. 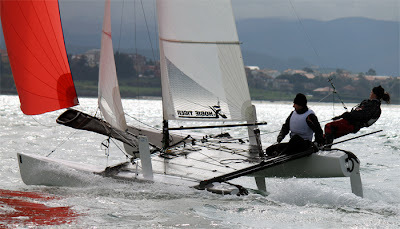 We had absolute great sailing in Santander! Olympic Trials are Over. Reports coming. I'm gathering info on the trials. Just received Roland's report, making an Interview with Jarlegan and also a report from Thijs Visser. Each camp published reports allavailable in their fcbk pages. More later. Photo Martina Barnetova. Sailors and manufacturer boats were tasted today by 15 knot winds and big waves as sailing took place outside of the channel for the second day running. 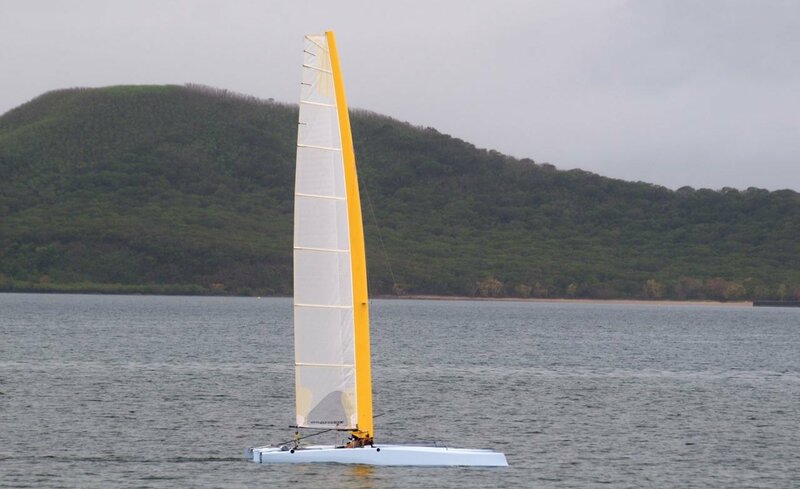 Racing took place in both the skiff and multihulls allowing sailors a chance to push themselves and their boats further than they had done so over the previous days of trials. The day gave the ISAF Evaluation Panel an opportunity to see the boats in trickier conditions and lots would have been learnt by not only the panel, but observers, sailors, media and manufacturers. At the close of the day the Viper Team presented their case in front of the panel. All of the manufacturers have explained why they think their boat should be selected for the Rio 2016 Olympic Sailing Competition and the presentations and question and answer session has allowed the panel to get down to some finer details. Just two days of trials remain for the skiff and multihulls so hopefully we will see some more action in Santander Bay before reports and decisions are made. The kiteboarders had a productive day on the water with new courses trialled. Having a mix kites, multihulls and skiffs within Santander Bay today was a pleasure to watch and we will try and get some kiteboarding footage up in due course. Issued by Don Findlay, Chair of Technical Comittee on the IF18CA official Website. Wind came late yesterday and they sailed outside the bay. Now they are waiting for good conditions. Which is the key to have a popular class worldwide? Well just plain simple: Having local builders to support the demand lowering import costs for a start. That is how we started here in Arg, with $9000usd F18s I made. Windrush Yachts from Australia is already offering an F18 option, the Edge and now is planning to build a new A-Class.The distinctive mark will be a 190x63 Wing mast section, with high flex. Words from Brett Burvill: "This mast was made already in 5.5m length for Moth dinghies with an amazing flex fore and aft due to extensive laminate development and very low weight. And of course crash proof for the moth is important"
Brett will be working with Mark Picav from BDG. "Mark and I designed and built the first racing hydrofoil moth before the worlds back in 1999/2000 and I won some races of that world titles that let us to the current moth class today. Prepreg carbon fibre construction and possibly a production rigid wing for the future. Mark has extensive Aeronautical experience and practical design initiative. We have made a good team before building the 40 catamaran Spitfire that foiled at 33 kts in just 15 kts of wind back in 2002." So the A-Class is quite healthy beyond their open rules with continuous growth. 2012 Worlds will be held at Florida, check posts below or A-Class label for more info. I've been invited to race, but is too close to the F18 Worlds in LA, and I still haven't that trip confirmed yet. More info soon on Windrush new A. 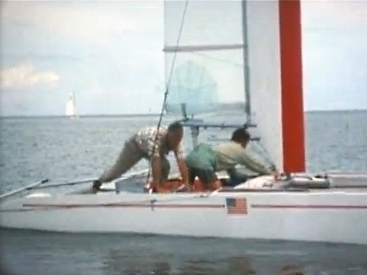 Left: "Back to the Future" seeing that US wingmast cat from the 1967 trials. Someone knows which boat is that? or who build it? It looks quite updated design. Below Fischer Wingmast tested last year. How come this kind of material is not widely available is beyond my comprehension. As for ie the Tornado Medal Race from Beijing. But kudos to isaf to publish this. Being a surfer as a kid I had plenty of material on the old days (Surfer Mag etc) I knew the history of the sport from A to Z, but with Cats? Only people present at that day or old fanatics can say they ever saw this, even in pictures. Spray rails, Wing Mast... all back in 1967, when the Olympic dream was born. Photo: Fabian Marelli/LaNacion.com -- Although many are considering him the best ever, in Argentina some still demand him a World Cup. 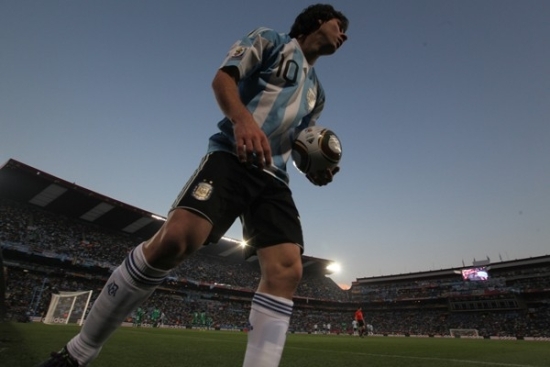 Brasil 2014 will be his chance. Beyond any personal details, Diego Maradona is still the best on pure ability and power, just check his goals, he also won a World Cup by himself in 1986. The good thing about Messi is his attitude, real humble and a gentleman, just like Fangio. For sure already a Legend for the Ages. "Light winds welcomed the sailors on the fourth day of the 2016 Equipment Evaluations meaning that sailing was postponed early on. Despite waiting for breeze, it was a productive morning for the female skiff sailors as they joined Evaluation Panel members Adrienne Cahalan (AUS) and Sylvia Vogl (AUT) in an informal session where they all gave feedback on the skiffs they’d sailed so far. 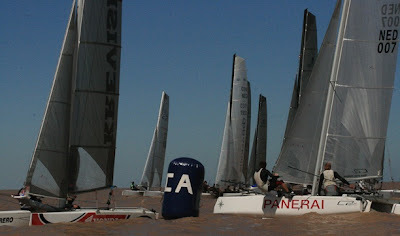 The wind started to fill in early in the afternoon and the sailors hit the water at 14:00 local time. Today saw the sailors finish sailing all of the seven multihull and six skiff boats. Sailor feedback forms have been completed and returned to the panel for evaluation and consideration. As we move into the second half of the trials sailors will move out of the bay to further test the boats, and themselves, in various conditions whilst continuing filling out feedback forms. Towards the end of the session a series of informal races were conducted between the mixed multihull crews who got the chance to face off against each other. Whilst the boats are not evaluated against each other in race conditions it was nice to see the competitive edge come out in many of the sailors." Check facebook pages from Nacra, AHPC and Gaebler's for their own reports. If you have more links of the others post them or let me know. No wind today yet. 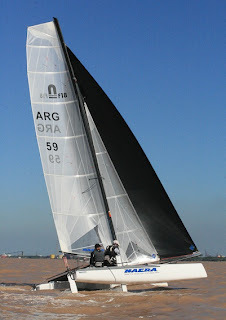 Part of the ARG fleet was racing on fri, sat and sunday for the first qualyfiing series for Los Angeles 2012. Almost 10 boats are willing to participate at this next World Championship. We also have several crews from Chile and Uruguay already preparing themselves to go. So John, you'd better have some rents boats available for us, or some parking space for the container. The guys are checking which is the best alternative. This first qualiying was won by Juan Faustín and Lucas Gonzalez Smith, with a solid performance on quite tricky light conditions with waves and strong current. Followed by Cruz G Smith and Mariano Heuser in 2nd and Sergio Mehl 3rd. Sergio saved his mast by a second as it was going down while he was launching at the ramp. This is the 4th time Sergio's shroud anchor point fails, and we have like more than 10 same situations on the fleet here, really strange thing. I think the tough conditions here are responsible, in any case, having more than 10 (all brands) mast down on the same failure is not that common. I think they need to equipe the boats again the the famous 'toggle' used by Hobie in the past. I sailed/raced again after 3 months, the elder sailor of the fleet called me again to helm, and we have a really good event considering zero training, we were 6th among 14 boats, just behind the top guys that train 3 days a week, with some Pros and Olympics hopes included. We managed to lead several windward marks, like the last race, but on tactical errors on my behalf due to strong current and lack of training or just plain simple errors, I couldn´t defend the lead at last downwind leg and ended 4th, situation repeated on several races, giving away 3 to 4 places on the last 100-200mts! Quite inconstant helming on my behalf, for ie the first races were 12,10, 5,5 with a capsize on the 1st one with 6knots downwind! But my crew stood the test, high demanding crewing due to technical conditions and 4 races on friday and sunday... so hat off again to Esteban Daneri, being 54 and sailing at top level, even supporting my 'demands' as a helm, all proof of his temper and guts. And of course his brand new MKII helped a little, really good boat. We will try to train more in the future to give the top guys a run for their money. This past week I've been told that all the mess in the class it is my fault. So this definitely confirms the Quantum Physics and Relativity theories I've been reading again lately, as some instances of myself were writing the rules, making illegal sails, changing the rules, protesting in the last day on a World Championship and so on in these parallel Worlds. It was all me, I knew it! So I will limit myself from now on to publish only F18 official docs or third party reports, so they can´t kill the messenger in the future. "It was a good day of sailing on the third day of the 2016 Equipment Evaluations as the sailors had their first full day of sailing, allowing the panel to check out the equipment in various conditions. Rainfall greeted the sailors during the morning session but with the wind blowing steady between 10-15 knots sailors got out onto the water to test the equipment. The afternoon session saw a variable breeze from 5 up to 12 knots with some of the sailors racing each other. And at the end of the day there were a lot of happy faces. By the close of play tomorrow many of the sailors would have sailed every boat and have an understanding of how each boat works. 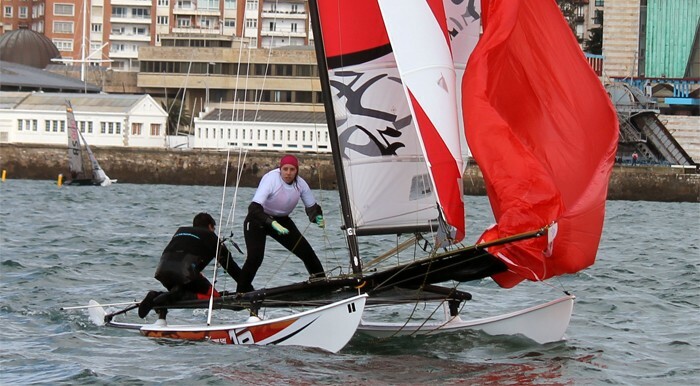 As the week goes on there may be an opportunity to sail outside of the bay..."
"The morning session in Santander served up some great conditions for sailing with no delays or interruptions that had plagued the opening first two days. A steady 8 knot breeze blew across the channel allowing sailors to test out some of the boats for the first time. There were a lot of smiles on the crews when the rain cleared up and the sun came out allowing ideal conditions to evaluate and test the equipment. Sailors swapped boats after one hour and filled out feedback questionnaires once back on shore allowing the panel to gather data for evaluation. Sailing will resume at 14:00." I started catsailing and racing because of the Hobie 'appeal' , being a surfer, windsurfer,wakeboarder and else it was what I was missing. The Hobie 16 Class in Mexico was exactly what a begginers need, all supporting you and teaching and all good vibes, I got hooked. Then just when returning to Arg, I saw the Tiger... and well that is the reason later I left an excellent position and future in the IT bussines for the F18 project. Below the Noriega bros from México, the entire family along the Murrieta and Ponce gave my wife and I the best times possible in and outside the water ever. The Hobie Tiger and the Hobie 16 are the options presented at Santander, and I think the Tiger can be a Salomonical decision and the F18 in Brazil will just explode with benefits for all brands as they can start selling their F18s in the land of cool, Brazilians are just easy, happy and cool people and of course they are quite good at any sport, in sailing just naming Grael and Scheidt, there is not much to add. So the Tiger can be a good option too. Now time to shut up... and see what is going on at Santander. I'm racing F18, today and this weekend so I will inform on monday I think. When AHPC launched their F16 bet, Olympics were not in sight for them, beyond entering a new class, the goal also was providing a test bed for their new C2 F18. 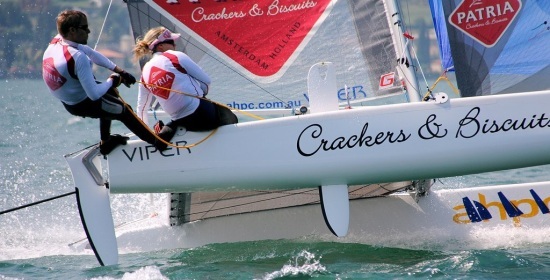 The Viper performed even before Bundock and Brouwer joined the party, but with them the australian builder got themselves the higher exposure and top results a small company needed to compete one on one with Hobie and Nacra. An F18 World Title for Bundy and Jeroen, plus the the F16 first Worlds, latest Olympic bid and Carolijn on her Viper showing several F18s the way at Texel and Thai regattas, has put AHPC on the limelight. Beyond any speculation, for mandatory mixed any F16 is the favorite choice as wrote before, but if selected I think it will only last as long as the Mixed option remains mandatory or if ISAF grants a 2nd spot for an Open option in 2020, leaving the door open for a Female & Open/Men combo. The performance is there, the class too, lets see what ISAF is looking for Rio 2016. I have a full report from Brett on Lfoils too, will publish later, I think they are taking them to Santander to show off as an alternative, but their official bid is equipped with their proven standard daggers. 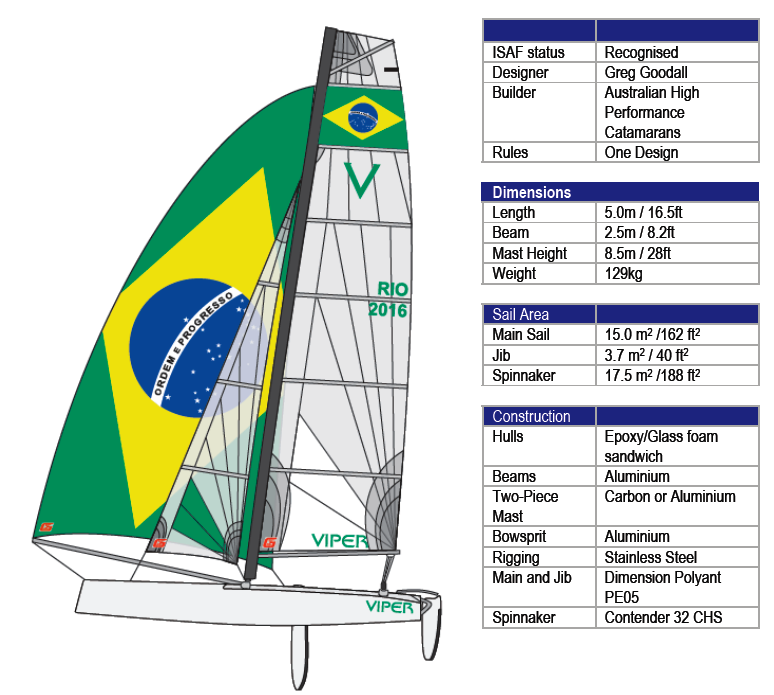 "It's the boat with bite and attitude to burn and now the Viper is preparing for the start of its most important race to date _ making it onto the 2016 Olympic sailing program in Rio. Already a big hit with sailing's Generation Next as well as current and past champions, the high-performance Viper will strut its stuff at the International Sailing Federation's Multihull Evaluation Trials for the 2016 Olympics at Prince Felipe High Performance Sailing Centre in Santander, Spain, from March 17-25. This is the chance for a boat already turning heads for its results on the water to win over a new legion of fans looking for a class to showcase sailing's future, its willingness to move with the times, its desire to be high-performance and media savvy and its desire to create a level playing field for men and women. The Viper also embraces "universality'' thanks to its relative low cost for its performance output, with older classes able to feed into the class and plans being discussed for a future series involving sailors from all regions and emerging nations. "It's the "skateboard" class of sailing, the cool one, the edgy one, the one that is creating a buzz on and off the water but still proven,'' said former world sailing champion and multiple Olympian Carolijn Brouwer, part of a skilled team of experts and sailors behind the boat and its exciting plans for the future. 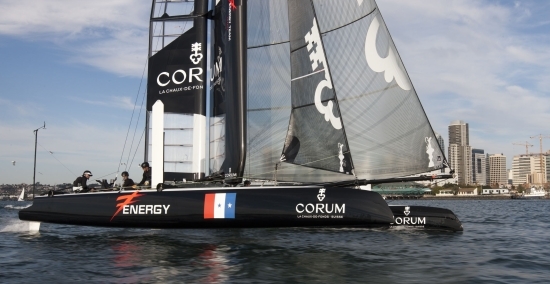 "It's the future of sailing, the class that is young and fresh but at the same time high-performance. It's a new, edgy look for sailing that ticks off the boxes, on and off the water, and is a proven performer with a long list of fantastic results in major regattas. "But perhaps one of its best attributes is that it doesn't discriminate in any way. I have won regattas as a skipper with a male crew and others have beaten me with a male skipper and a female crew. 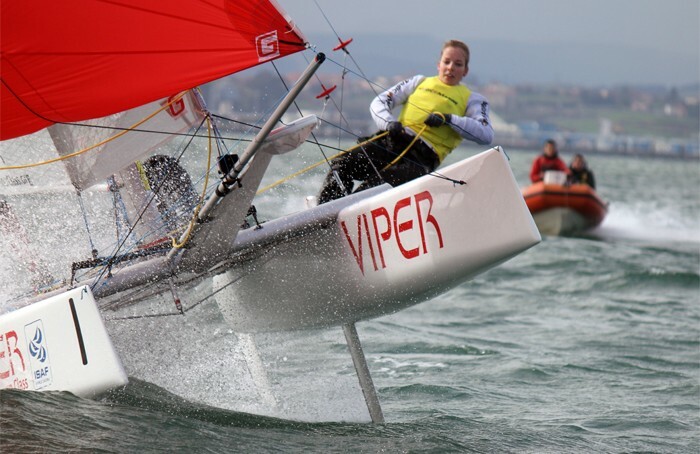 As elite sailors, Brouwer and former multiple world champion and two-time Olympic medallist Darren Bundock have focused on making the Viper a boat that impresses not only on the water, but on the result sheet, in the boat-park and in the headlines. The class have at their disposal a team of technical and coaching gurus along with media and marketing experts to ensure the Viper and its sailors are big hit on and off the racetrack. 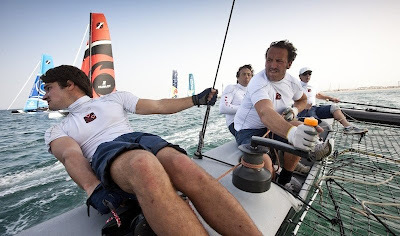 Coaching, expert technical advice, media training, promotion and a social media campaign are all part of the classes plans as it looks to attract a new legion of sailors, fans and followers to the sport of sailing. "We believe this is the right boat for sailing to show it's future, that it moves with the times, that it is fresh, appealing and media friendly. In short, that sailing is both fun and cool,'' Bundock said. "The Viper shows the sport moves with the times, that it looks forward not backwards and that it is willing to embrace change for the better. 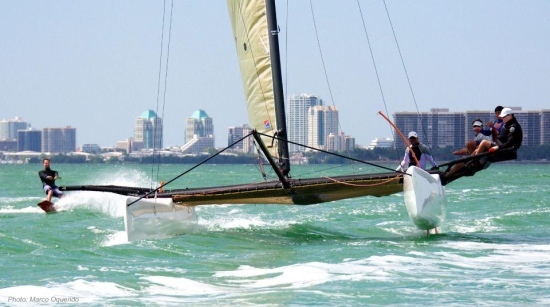 After seeing this pic of the M32 at Miami , I remembered the wakeboarding good old days, when I was young! 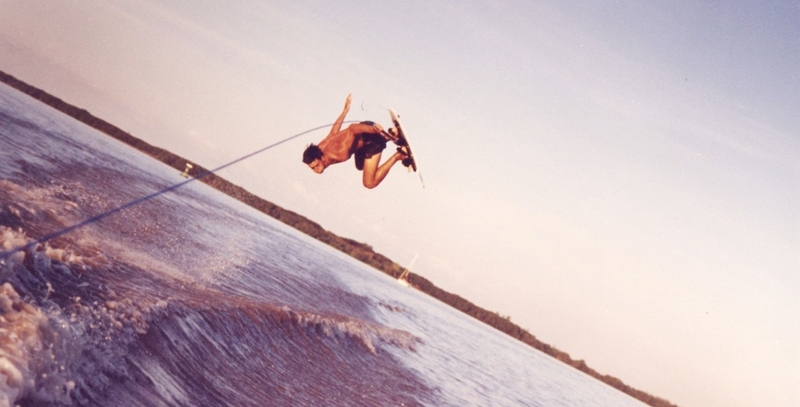 With my cousin Nadal Solari we were among the first wakeboarders in Argentina, and of course you can guess who built the first Arg made board? We have several "first" within the family, like Nadal's father building the 1st Arg surfboard circa 1961 and of course the F18 project. Below: I think that is circa 1996, and I ended on my back... not a chance I can stand that abuse now. Wooden deep channels 'Keltic' board (brand I used to sell them, the logo was a Viking axe) I made on cedar plywood and painted with epoxy of course. I always read some comments on how x brand manage their business (not many now that anons are forbidden..) but beside different ways to work, one thing is for sure, these guys are pushing the envelope and building new boats, to me that is one of the main thing to analyze in a cat builder company. 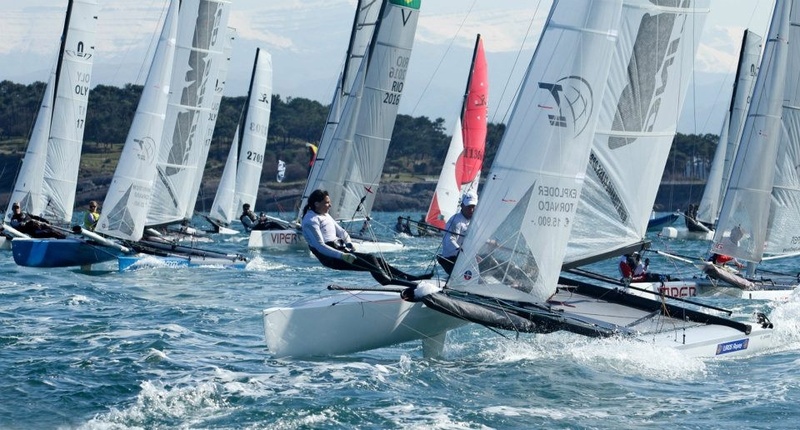 The Infusion was the first step of the brand comeback, then the F20C, Formula 16 and now the N17... Nacra is delivering lots of alternatives for the 21st century sailors. You can affirm that they are working hard for the sport. Tony Grainger is one of my favorite designers. I always check his web for innovative and stylish concepts. This is the 'Flying Fish', a multiple conf design based on the same platform. 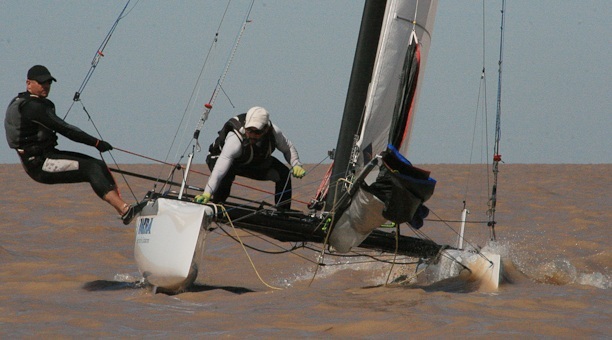 This concept in the 26-35 range is what people here in Buenos Aires are going to be forced to ride, literally discarding their monohulls due to the Rio de la Plata continuous drop in depth created by the Parana Delta sediments and new 'islands' being created every year. Even F18 longboards are giving us a hard time. We are already having a new era with the F18s and other cats showing what multis are all about, to this previous 100% monohull sailing community. Only a few pioneers were exception of the mono rule, but in the future the defacto water craft is going to be only Multihulls. So as we don´t have any old design here, as no cruising/club racing cats were built (I think only one but not much success) this could be the new looks of the Argie weekend, daysailer, and club racing machine. The 2012 world championships, hosted by Ronstan, will be held out of "The Islander" resort in the tropical town of Islamorada in the Florida Keys from Oct 19th – 27th. 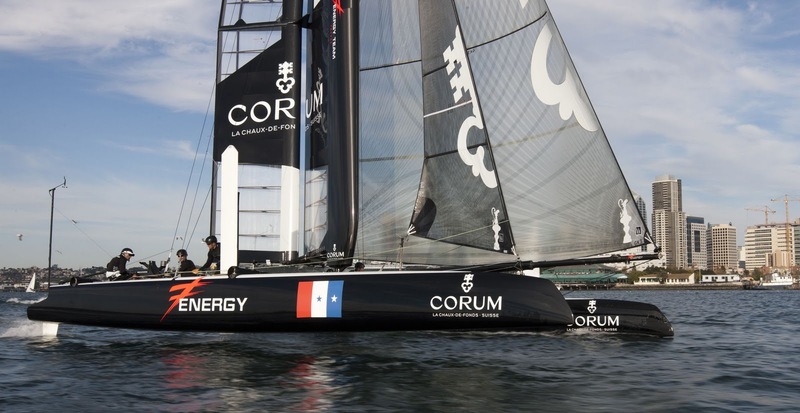 The event is expected to attract some of the world’s top sailors, including current world and Olympic champions from a number of classes, as well as some of the top America's Cup sailors and designers. This site will be a valuable tool for all competitors planning on attending the 2012 WC. You can access the notice of race and online registration, as well as information on accommodation, freight, logistics, insurance contacts, travel tips for “getting there,” and a whole lot more. For both sailors and supporters of the event the site will continue to evolve and will be your main source for updated news and information. Visit it often for everything from “Things to Do” suggestions to sailors' information related to counties represented and equipment of choice. Here you will also find lead-up videos and stories relating to the event, class, and the local area. During the event, the site will be the main link for the outside world to follow all the action. Friends and family can view daily video reports, interviews, a live on-water Tracking tool, and Twitter feed. For companies wishing to get involved with this world-class event, sponsorship opportunities exist. Information and contact details can be found on this site under the sponsors tab." 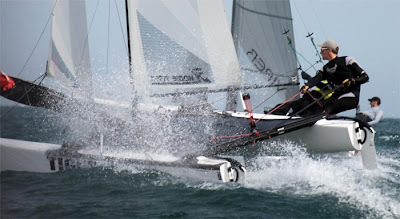 "The racing format contains 2 vs 2 F18 multihull team races. Racing on a digital N course. The last boat to finish, loses as a team. There will be 4 teams (8 boats total). Blue, Green, Orange and Purple. The winners go through the next round the losers will be knocked-out! The winners go on through the final wich will be a best of three series. 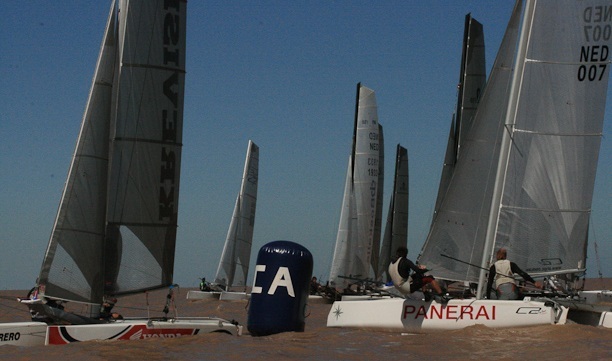 The goal of the event is to make sailing a spectator sport and to promote sailing in general! -The races are covered by cameras onboard, 2 multicopters, cameras on ribs and on a tower ashore. -Live commentary will be done by three experienced sailors on a tower ashore and on the water. -The event is broadcasted live on the internet (Sailing Anarchy, Catsailingnews, Clubracer, Sailreport) and on site via a 3 by 6 mtr outdoor led-screen. 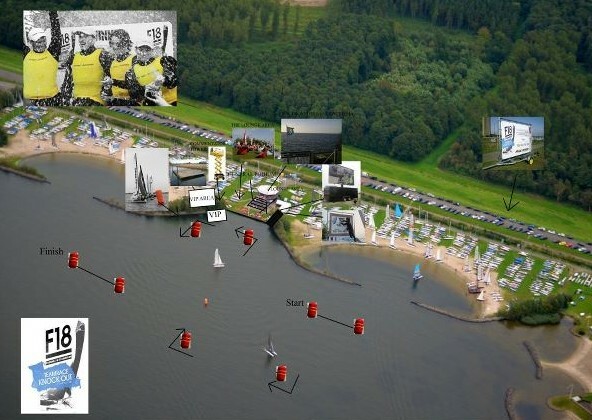 -We expect around 1000 people there as audience and we will give them all sorts of team gadgets to cheer for their team and to create a sailing arena atmosphere. -Umpires will serve as referees on the water. There will be two ribs with two interantional umpires each. -The crowd will watch the event so close, they will be able to touch the boats!" I called them the Dark Horses and I was right again on chosing the underdog! But it seems the Peyron bros are struggling for funding, so I think that Ernesto Bertarelli should, do it in the background, nobody will know... but you'll have a great chance to challenge Oracle and even win the cup, in any ocassion you will involved in a top notch multihull project again (if not yet...) so if Oracle end winning Alinghi will be more than prepared for a comeback. Come on Ernesto, I'll put a banner to "help" the funding if you want! A Cup without Energy Team, at this stage is not going to be that interesting and fun. Aleph is already out. Perfect debut for Santa Cruz, CA surfer, Morgan Larson. With Olympic Tornado sailors onboard, Charlee Ogeltree, that left CT , and british William Howden. 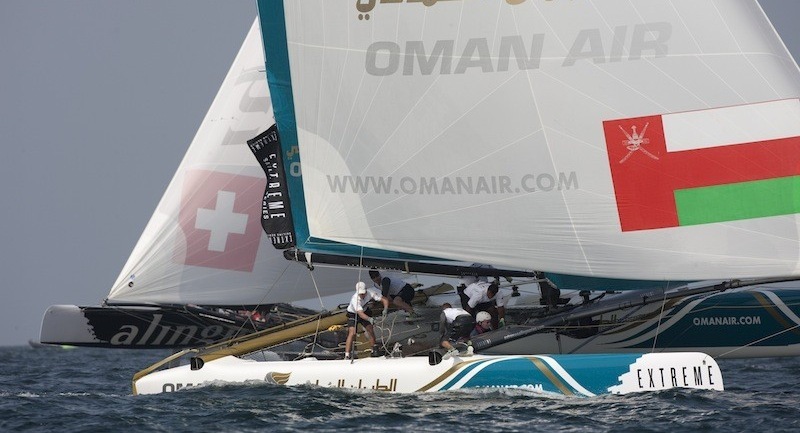 Oman Air crew completed with Nasser al Mashari and Max Bulger. Bertarelli didn´t shine but I guess he is having fun, but I prefer him to fund Energy Team too for building the 72. Close definition between Oman Air and Muscat. Hey, I know that guy. 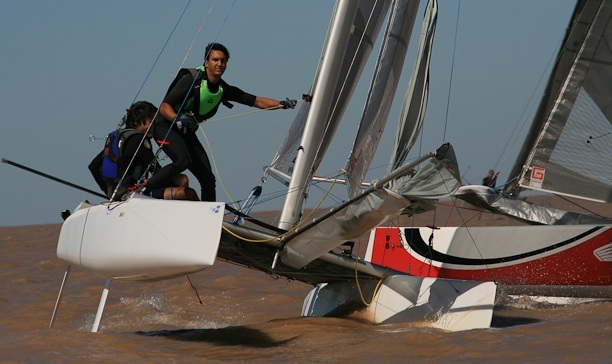 Pierre Le Clainche and Antoine Joubert, F18 Youth World Champs, and friends of the Arg F18 fleet, racing at the Xseries. These two are aiming high, best of luck for both.